Physios in Australia are using a Nintendo Wii accessory to help them rehabilitate people who have had a stroke, according to an article in The New Scientist. 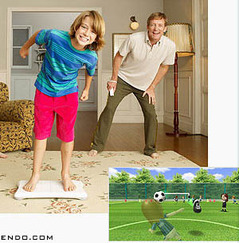 It turns out that the £69.99 Wii Balance Board is a useable alternative to the lab-grade “force platforms” currently in use that cost £11,000. When re-teaching people how to stand and walk after serious accidents or strokes, it helps physios to be able to record how much weight a person is putting on each foot to judge how good their sense of balance is. The cost of the official “force platforms” means that many physio clinics can’t afford them. The Wii Board needs to be hacked and customised a bit but according to the New Scientist, Clark and his colleagues at the University of Melbourne, Australia, were impressed by results rendered up by the strain gauges and accelerometers found in a Wii Balance Board. “We found the data to be excellent. I was shocked given the price: it was an extremely impressive strain gauge set-up.” he said. The data is clinically comparable to that gained from force boards.